I have been talking a lot about beading and knitting, learning beading to incorporate with knitting, but I haven’t shown you anything yet. I think my Intro to Beading stage may last a while, here is my first report! You may recall that I took Laura Nelkin’s introduction to beading as one of my classes at the Vogue Knitting Live event in NYC in January. 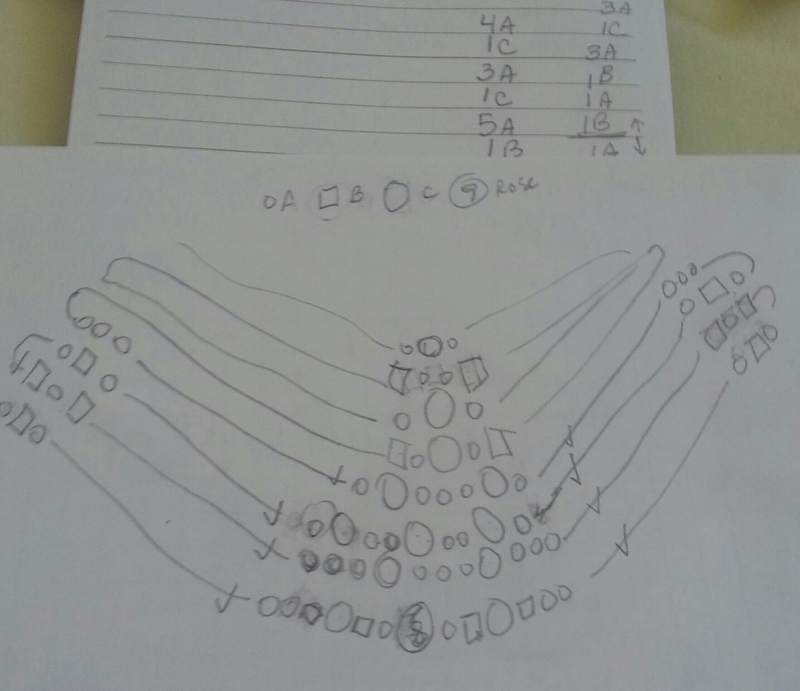 She taught us the basics of (1) putting the beads onto the yarn and sliding them into stitches purlwise and knitwise and in placement on which “leg” of the stitch and (2) adding a bead onto a stitch without adding them all to the yarn first. From there, I bought her Butin collar kit, but was unhappy with my results. I had trouble with the cast on and thus ran out of working yarn, and it turned out that the color combination I chose (“Montane”) tended to look dingy. 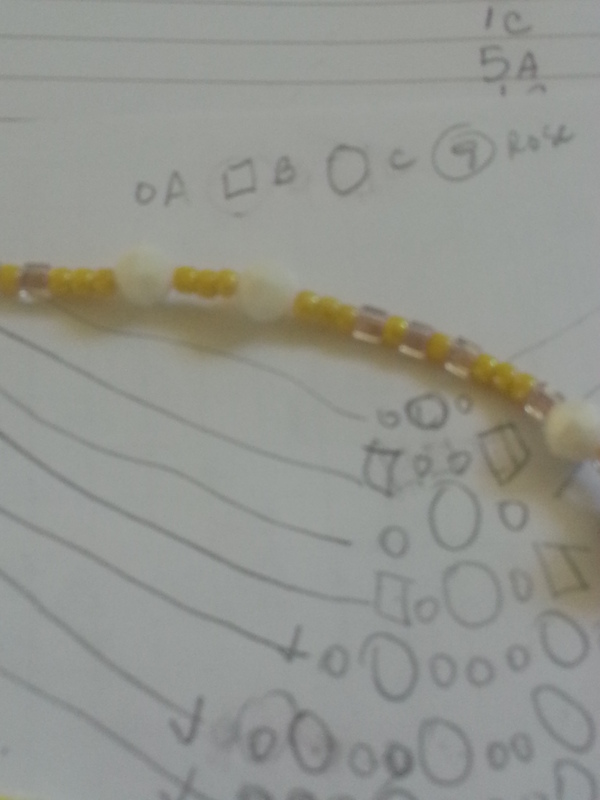 Not deterred, I decided to play off her design and use it to play around with other beads and colors. 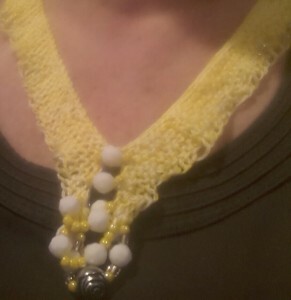 I used two strands of crochet string – yellow and white – with the same color beads and a silver rose bead at the base. 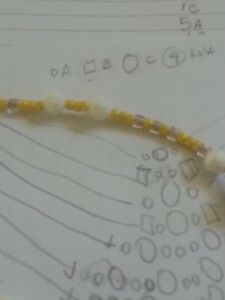 I drew out the design and strung the beads onto the threads. Casting on was difficult because the pattern uses the backward loop cast on, which I find makes the stitches really tight. I got around this by using two needles together. You can see that each stitch is two strands. I use a marker every 10 stitches so that it’s easier to not lose (or add!) any stitches. 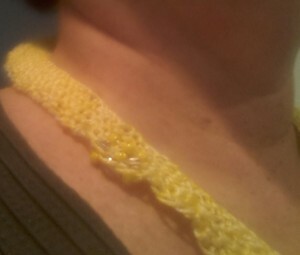 I followed my pattern and then had some more fun with the clasp. I decided to put some beads in the stitches that attached the clasp. The hardest part was making sure that I was attaching the two pieces in the right direction on each side! I am happy to report I (concentrated, paid attention and) didn’t make any mistakes and only had to sew on the clasp once! I used the blocking wires I bought at the Vogue Knitting Live Marketplace in January. 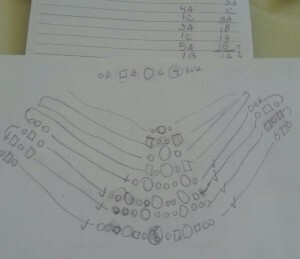 These are long bendable wires that are woven in the knitted piece and then pinned down for blocking. 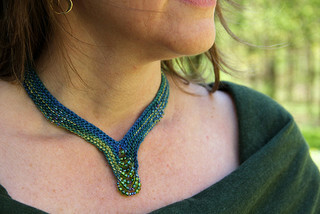 They worked really well and helped maintain the curve of the necklace.